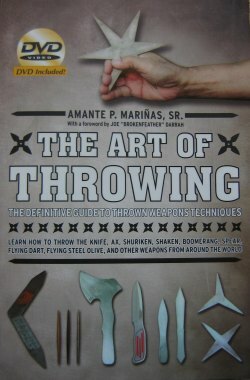 Book "The Art of Throwing: The definitive Guide to Thrown Weapons Techniques"
Over the past years, the author Amante P. Mariñas Sr., has thrown different objects for a total of 1.3 million times. This book contains the knowledge and experience he gained, and also tells the story of his throwing journey. The different varieties of knives are presented in the next section, before a very brief section on axes. The second half of the book is on alternative throwing weapons like spears, Japanese and Chinese specialities including stars, shuriken and coins, or the ordinary dart. As with the knives, for each implement there are explanations as to how to grip and throw it, illustrated by many photos. Additionally, the author gives diagrams with his learning curve for each throwing object, detailing how his sticking rate developed over the months. (Beginners can not expect to start with such a high success rate as the author who has mastered several throwing styles already.) Since Mariñas has a background in martial arts, self defence related aspects are mentioned frequently. For the appendix, the author made contact with some well-known thrower-personalities from the USA and Europe, and conducted email-interviews. The result are 19 profiles of professional artists, hobby sportsmen, knife- axe- and shuriken-throwers, which are quite worth a read. 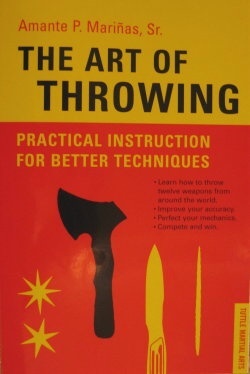 On about a page each, their throwing-lives are recounted, together with their preferred throwing techniques and individual expert-hints for beginners. It's interesting to learn about the community each thrower eventually found (for example my profile sports a group photo from an EuroThrowers event). For those of us who must see a movement to understand how it's done, the book now ships with a DVD. In a solid hour, the author takes up some introductory topics like grips or warm-up stretches, and is then shown throwing the range of his throwing gadgets. Altogether, the book contains the insightful experiences of a master thrower, albeit in a very condensed form. Beginners will often wonder (despite the DVD), but advanced throwers will love the chance to read about such a variety of throwing objects. This recension refers to the updated edition of the book that appeared in 2010.